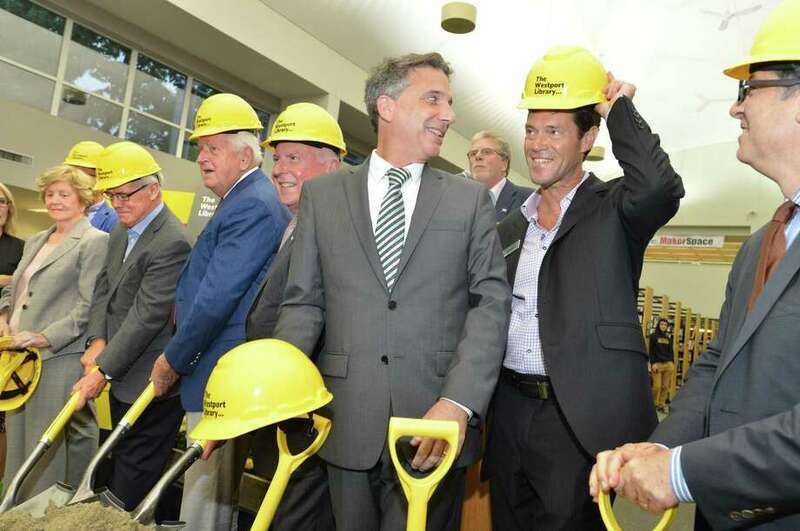 WESTPORT — When five-year-old Julian Hinojos got to the Westport Library’s groundbreaking ceremony to kick off its transformation project, he wasn’t interested in the yellow hard hats, shovels or buckets of dirt to symbolize the project’s start. Instead, Julian kept asking his mother, Hilary Nordholm, if they could go to the kids’ room to pick out a book. Nordholm, wife of library trustee Adrian Hinojos, said this is typical of Julian and his sister, Tess, 3. Nordholm often takes the two to the children’s room to pick out books or to the library’s maker space. They also participated in the library’s summer reading challenge and regularly come to reading programs. The Jesup Road building already holds a special place in the youngsters’ hearts and Nordholm is looking forward to now seeing the library grow with her children as it undergoes its long-awaited renovation. “What’s exciting to me is as they’re growing up here in Westport, their imaginations can grow with the library,” she said. The $19.5 million project broke ground in a ceremony Sept. 14. Construction is projected to last 18-21 months during which time the library will be kept open to the community. The end result will include a redesigned entrance to the Riverwalk Level of the building, which will become the home of the adult book collection, as well as a newly-renovated gathering space in the main level which will be used as a “flex space” for everyday activities and can accommodate up to 500 people. Hinojos said he’s also excited to see the improvement to the already-existing library space, which hasn’t been significantly updated in nearly 20 years. At the groundbreaking, Harmer said he is thankful to the Westport families and donors, including First County Bank, which is providing bridge financing — a short-term loan used until a long-term financing option can be arranged — for the project. Seventeen million dollars have already been raised for the renovation. “It takes a village to make this happen and what a village Westport has,” Harmer said.